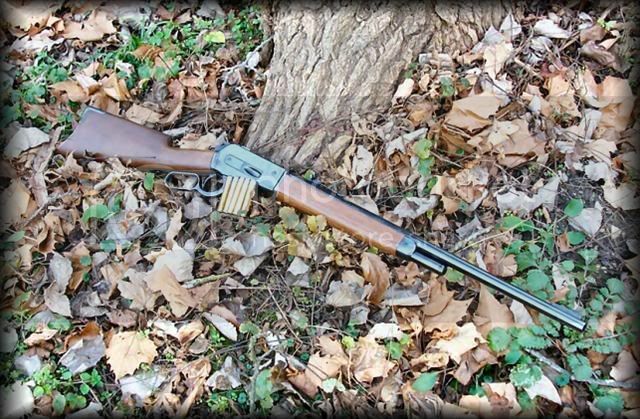 The following is not new information, but I have found little info with pictures as far as fieldstripping the Winchester/Miroku 1886. I thought it might be helpful to those who own these fine leveractions to have such....Click on images to enlarge. 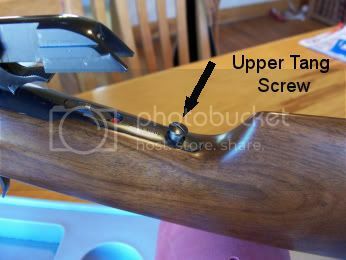 STEP ONE: Remove the upper and lower tang screws and pull buttstock straight off the rear of the receiver. The upper tang screw goes all the way through and screws in the bottom tang. 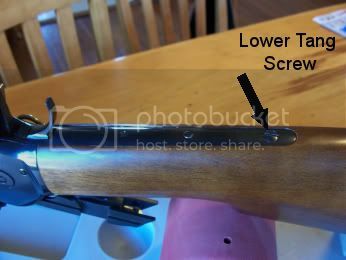 The lower tang screw is a wood screw. STEP TWO:With the action closed pull the hammer to rear and remove the receiver (hammer) screw. You want to captivate the mainspring before removing the receiver (hammer) screw. This coil mainspring is strong and may fly to the next room if not held in place. 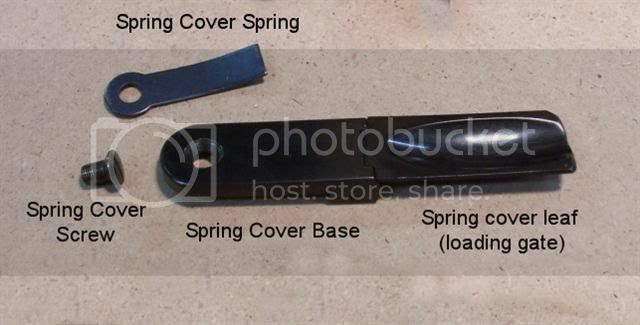 You can use a paper clip or similar item to hold the mainspring in place. STEP THREE: After removing the receiver (hammer) screw, open the lever and pull the lower tang straight back out of the receiver. At this time the hammer will drop out as well. 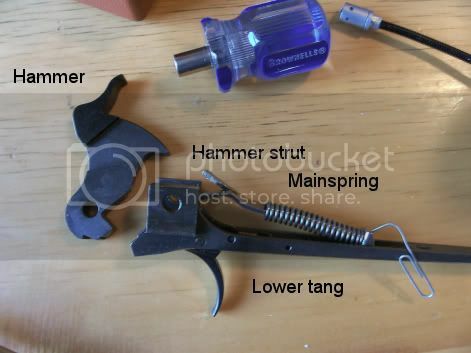 Pictured below is the hammer and lower tang assembly. 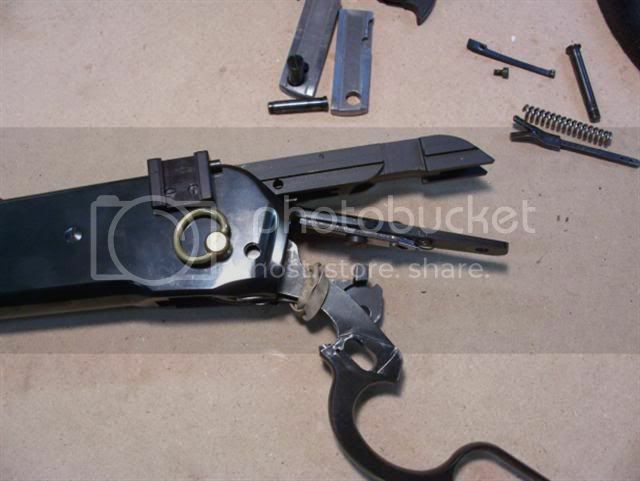 The trigger assembly was not taken apart but it consists of the Trigger, Sear, Trigger Spring and the Pivot (Trigger) Pin. STEP ONE: Remove the Spring Cover Screw from the right hand side of the receiver. STEP TWO: Unscrew the carrier stop screw and remove the carrier stop from underneath the upper tang. STEP THREE: With the action part way open, unscrew the locking bolt stop pin screw from the left locking bolt. This will allow the locking bolt pin to be pushed out of the lever and locking bolts from right to left. Now pull out both locking bolts from bottom of receiver. 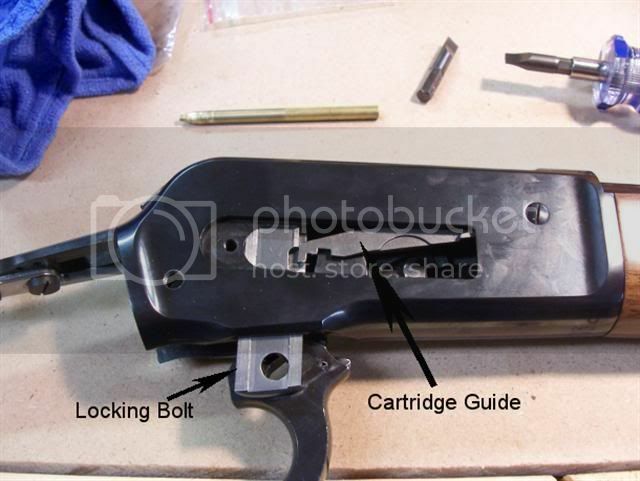 If you have trouble pulling the right locking bolt out of the bottom of the receiver, move the cartridge guide up or down, whichever is necessary, to allow the locking bolt to be pulled out. 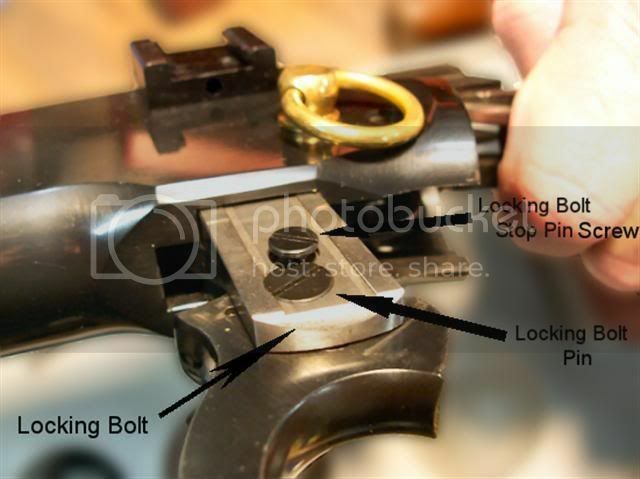 STEP FOUR: Lower the finger lever and slide the Breech Bolt out of the receiver far enough to see the lever and Breech Bolt Pin. 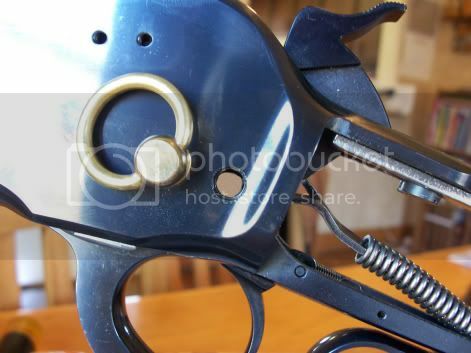 Use a punch to drift out the Breech Bolt Pin out of the Breechbolt. 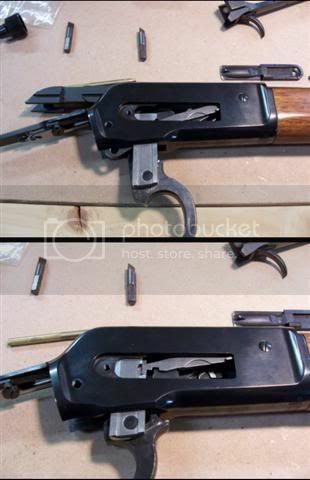 After removing the Breech Bolt Pin, pull lever out of the bottom of the Breechbolt and slide the Breechbolt out of the receiver. Be careful when pulling out the Breechbolt as the Ejector, Ejector Spring, and Ejector Collar is now loose and can fall out the front of the Breechbolt. 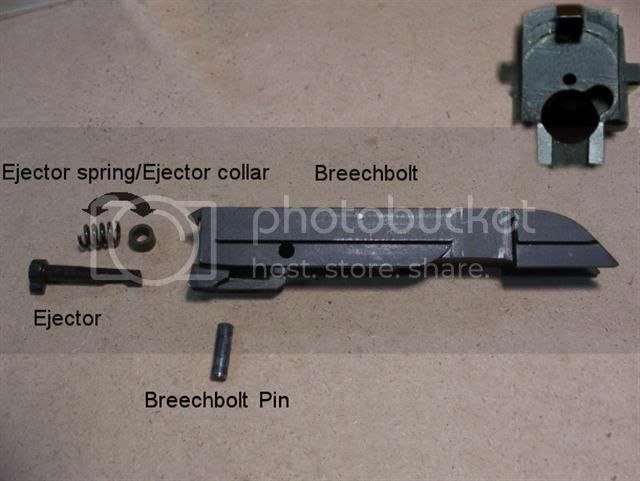 Once the Breechbolt is out of the receiver remove the Ejector, Ejector spring, and Ejector Collar out the front of the Breechbolt. 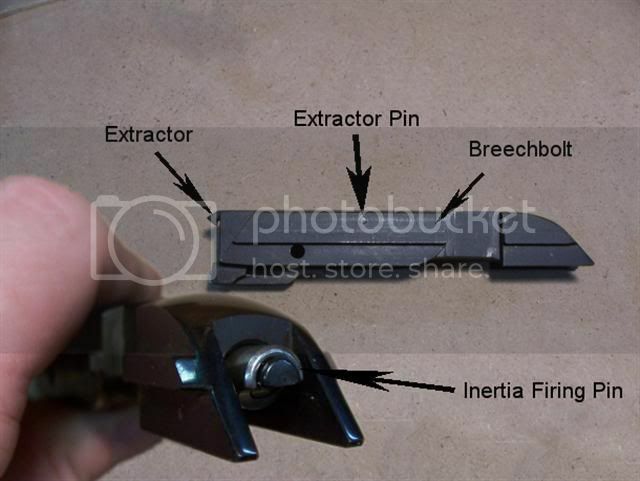 The firing pin is of the inertia type and can be removed by using a punch to drift out the Extractor pin. 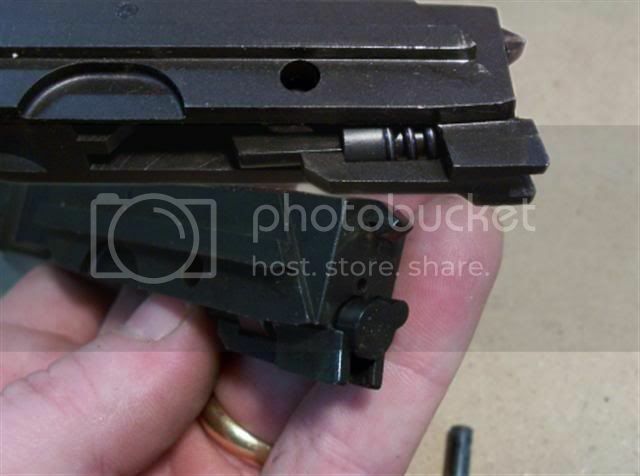 Once the Extractor pin and Extractor are removed the inertia firing pin can be pulled out of the rear of the breechbolt. 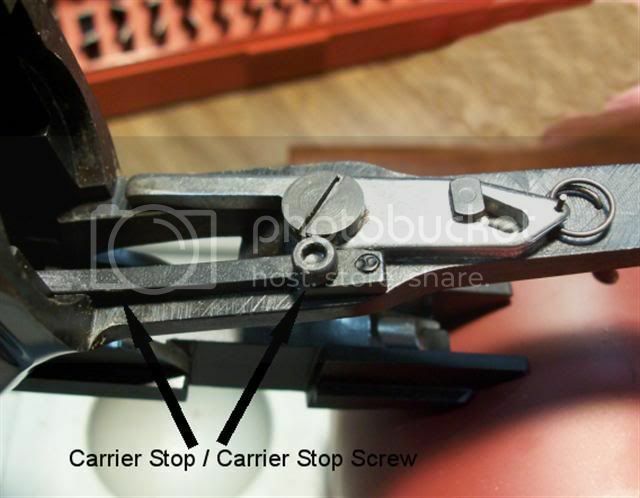 STEP FIVE: Slide the Lever, Carrier Hook and Carrier out the back of the receiver. Notice how these parts go together for reassembly. 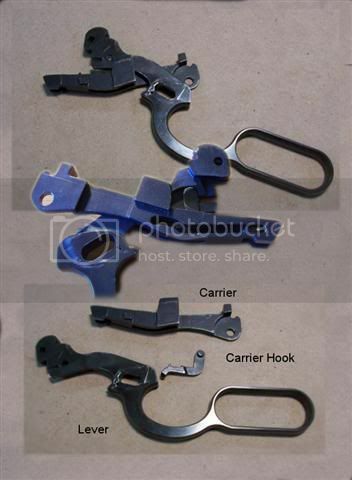 The Carrier Hook connects the Lever And Carrier by the lower hole in the lever and (rides in the middle of the Carrier) a channel cut out of the Carrier. 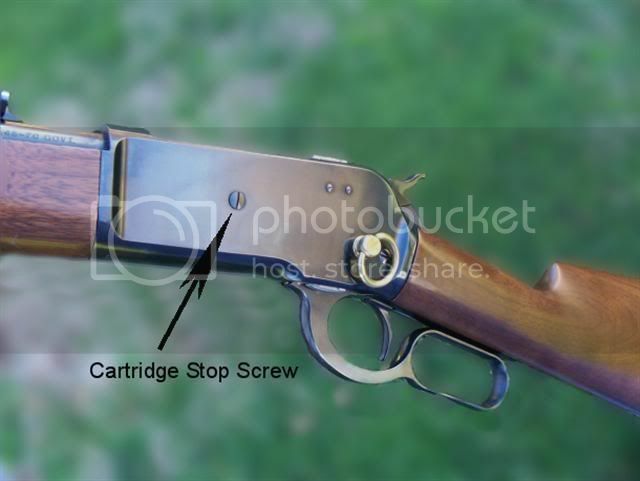 I didn’t take the rifle down any further, but if need be you can remove the Cartridge Guide and Cartridge Stop from the receiver. To remove the cartridge guide simply unscrew the cartridge guide screw from the right side of the receiver and remove the Cartridge Guide from inside the right hand side of the Receiver. To remove the Cartridge Stop, unscrew the Cartridge Stop Screw from the left side of the receiver. 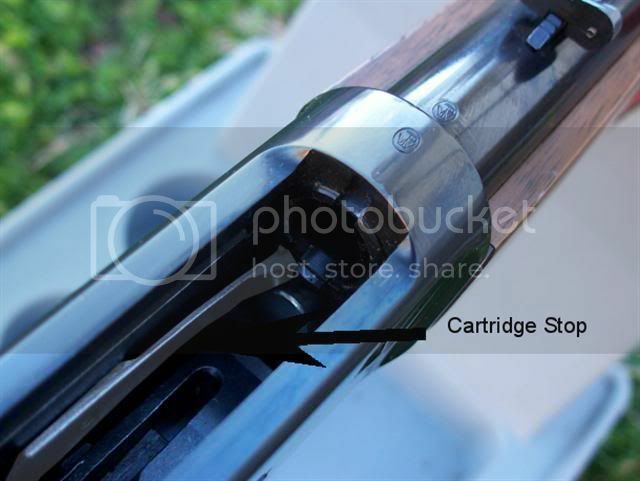 The Cartridge Stop is highlighted in the picture below. Now to get all these parts back in the ’86! To get the Lever, Carrier Hook, and Carrier to stay together for reassembly it is much easier to use a rubber band to hold these parts together. If not, you can become frustrated in short order. STEP ONE: Slide the Breechbolt assembly partway into the receiver. 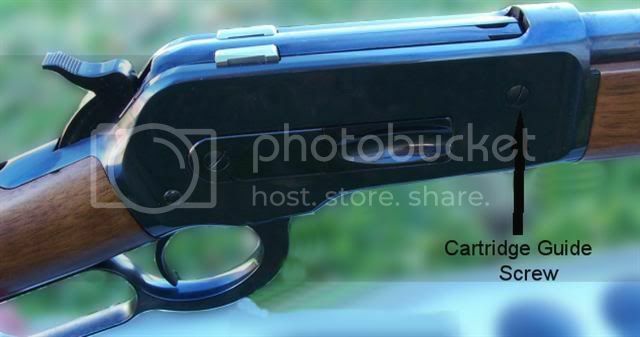 Slide the Carrier, Carrier Hook, and Lever into the rear of the receiver. 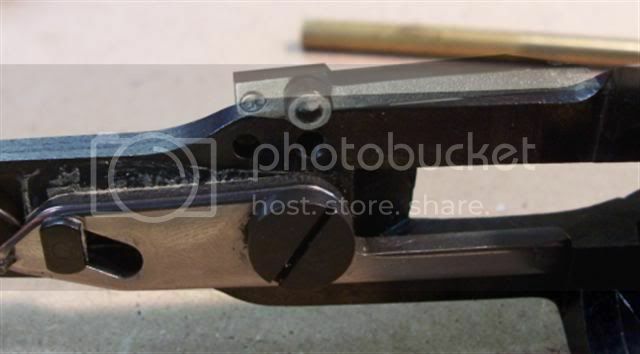 Lineup the Lever and Breechbolt and insert the Breechbolt Pin into the Breech Bolt. 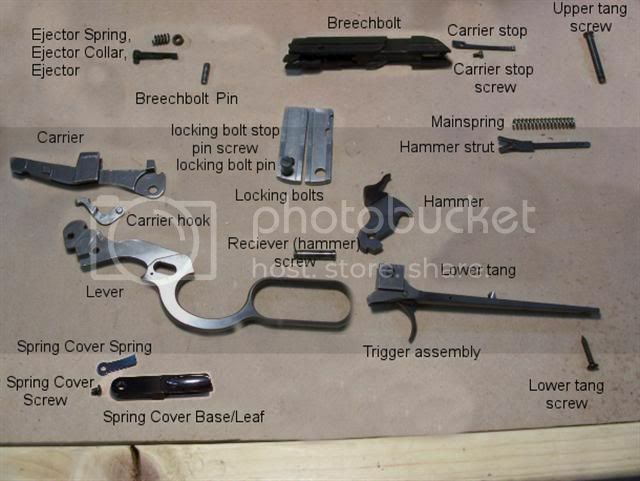 You will need to make sure the firing pin, and Ejector is both pushed in far enough into the bolt, and that the lever is lined up at the same time so the Breechbolt Pin can be pushed into the Breechbolt. Fun isn’t it? This is just about the time you wish you had a third hand, but in no time you will have these lined up and the Breechbolt Pin inserted. 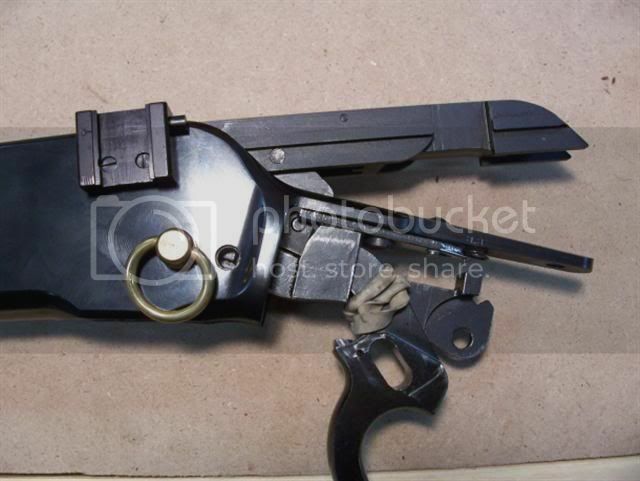 Slide the Breechbolt, Lever, and Carrier on in the receiver. Once you get these parts into the receiver far enough discard the rubber band. Now on to the Locking Bolts. STEP TWO: Insert the Locking Bolts in from the bottom of the receiver and install the Locking Bolt Stop Pin and screw. Again if you have problems inserting the right Locking Bolt, move the Cartridge Guide up or down whichever is necessary to allow the right Locking Bolt to go up into the receiver. The right Locking Bolt has a channel or groove cut into it to move the Cartridge Guide up and down while the action is cycled. STEP THREE: Install the Spring Cover Assembly. 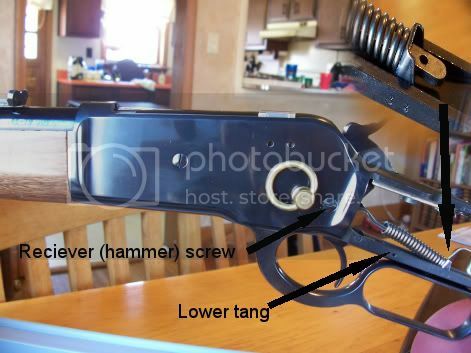 STEP FIVE: Install the Hammer and Lower Tang Assembly back in the rear of the receiver. Again this is somewhat of a juggling act and a third hand could come in handy at this point. You need to keep the Lower Tang pressed in while making sure the Trigger is pulled back while aligning the holes in the Hammer and Carrier. Use a punch to help align the parts. STEP SIX: Install the Buttstock.